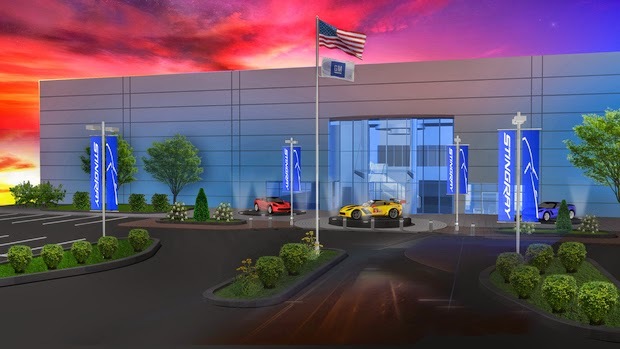 Does GM's new performance lab, colocated with electric motor lab, mean future electric race cars from GM? GM's announcement today that they'd opened a new "state-of-the-art" facility for designing engines and gearboxes for race vehicles might make you wonder why it's being covered on Electric Race News. The reason why is this: "General Motors today began construction of a state-of-the-art facility for race engine design and development, as well as an electric motor laboratory and gear center." The phrase in bold, "an electric motor laboratory," is making me scratch my head and go "hmmm...?" What's really going on. The press release talks about something that's a core reason why I'm covering electric racing: "GM’s continued investment in motorsports comes from the time-tested belief that racing is the ultimate proving ground for much of the technology that applies to the vehicles GM sells." The way I see it, the electric motorcycle racing scene has been very good for electric motorcycle development. In 2009 the state of electric motorcycling was pretty poor, and dominated by home built machines of wildly varying quality. 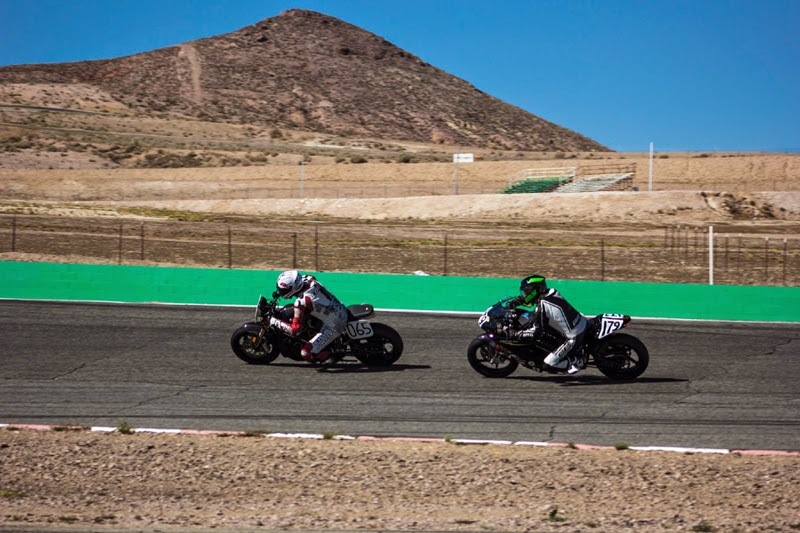 Today we have Zero and Brammo duking it out for dominance, both offering excellent motorcycle designs, and in both cases they've used their racing activities to gather useful data for their production electric motorcycles. And it wasn't just those two, other companies were in the same boat, with Lightning Motorcycles and Mission Motorcycles both doing some kind of production runs. But - GM hasn't shown any sign in the past of involvement with electric racing. It's not clear from the press release that locating an electric motor design lab alongside racing engine design labs mean that GM is exploring anything to do with electric racing. Engineers at the GMPRC will work on powertrain-related projects for GM’s involvement in the NASCAR Sprint Cup Series, NASCAR Nationwide Series, NASCAR Camping World Truck Series, Verizon IndyCar Series, TUDOR United SportsCar Championship, Continental Tire SportsCar Challenge, Pirelli World Challenge, NHRA (COPO Camaro Program) and Global Rally Cross. The Chevrolet and Cadillac racing teams have seen much track success. Since its inception in 1999, Corvette Racing has won 10 manufacturer titles in GT competition and 92 global wins, including seven prestigious class wins in the 24 Hours of Le Mans. Team Cadillac, since 2004, has amassed 24 wins, 82 podium finishes and 20 pole positions. The team won the World Challenge Manufacturer Championship in 2005, 2006, 2012 and 2013. Nothing about electric racing - it's all about gasoline driven racing. GM also took over as the Engine manufacturer for the IndyCar series. As I recall, Honda had that role back in 2010. That series is driven on Ethanol, so it means GM is gaining a lot of expertise in running high performance engines on biofuels. When I asked Honda's VP overseeing their IndyCar involvement whether that rolled over to Honda's retail vehicles sales, he said "No." Maybe this, too, means nothing to GM's design of biofuel-capable vehicles? 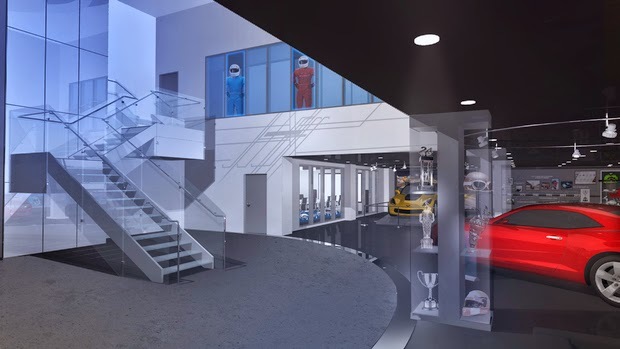 In addition to the performance and racing engineering, the new facility will house an electric motor lab and a gear center. The electric motor lab produces prototype electric motors and validates manufacturing processes used in the production of electric and hybrid vehicle motors. Electric motor engineering, design and validation are core competencies for GM in the development, sourcing and manufacturing of electric vehicles and their major components. The gear center supports design, manufacturing processes, inspection techniques and testing of gears used primarily in the next generation of GM transmissions. Taking this on face value, it means nothing more than Management decided to colocate these two labs for some other reason than doing something about electric racing. It's just a coincidence. Nissan, for example, has developed the ZEOD RC as a plug-in hybrid electric race car. With it they plan to enter this years 24 Hours of Le Mans. This forward thinking is commendable. Does GM have anything like this up their sleeve? 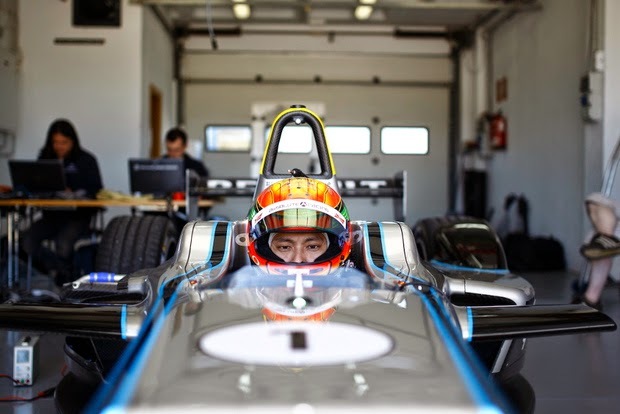 MONTEBLANCO, SPAIN (April 30 2014): Ho-Pin Tung – the first Chinese driver to ever test a Formula 1 car – reckons that the all-new FIA Formula E Championship will feature ‘super-close’ racing, after testing the fully-electric Spark-Renault STR_01E race car for the first time last week. Tung, who has tested F1 cars for Williams and Renault, piloted the single-seater at the Circuit Monteblanco in Spain. He completed three race simulations and was impressed by what he experienced. The 31-year-old, who currently races in the Asian Le Mans Series and the Asian Carerra Cup, was surprised by the performance of the first ever all-electric single-seater which will be used by all 10 Formula E teams when the season gets underway in Beijing on September 13 2014. Having raced in A1GP and Superleague Formula, Tung reckons the Formula E concept has great potential. 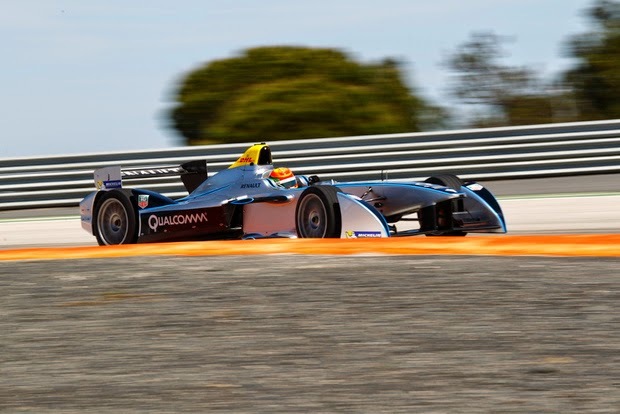 Formula E is a new FIA championship and the world’s first fully-electric racing series. Beginning later this year, the championship will compete on 10 city-centre circuits around the globe including London, Buenos Aires and the opening round in Beijing. Ten teams, each with two drivers, will go head-to-head to create a unique and exciting motor racing championship designed to appeal to a new generation of fans, whilst accelerating the electric vehicle market and promoting sustainability. After more than 3,000km of running, testing for the SRT_01E is now complete with the first delivery of cars arriving at the new Formula E Donington Park headquarters on May 15 when the doors to the new facilities will officially be opened. Colorado Springs, April 9------After winning the high-profile Unlimited Division nine times, including six straight from 2006-2011 in a variety of high-powered Suzuki sport autos, it remains a great story that he has switched to the Electrics in The Broadmoor Pikes Peak International Hill Climb for the third straight year. 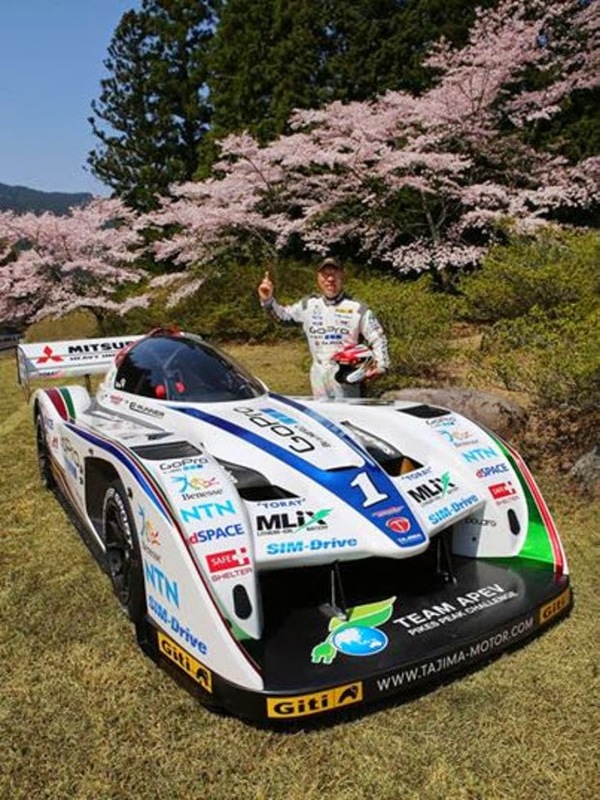 The renowned Japanese star, who was the first competitor to break the once unthinkable 10-minute mark when he achieved the honor in 2011 when he drove his Suzuki SX4 to the summit of America's Mountain in 9:51.278, will be back on June 29 in his Tajima Motor E-Runner model in the now highly competitive Electric Modified Division. His legion of fans were stunned when his first attempt in an Electric auto failed in 2012 when his model was forced out by a fire. But last year, he showed that he is still a champion and King of the Mountain hopeful once again when he drove his Tajima Monster Sport Special electric auto to a blazing time of 9:46.530, the 7th fastest time in the history of America's second-oldest motor sports race behind the Indy 500. Nicknamed "Monster" by fans and foes alike, the 63-year old driver shows no sign of retiring from the PPIHC any time soon, and that's great news for fans who will be on the course again this year to watch the famed auto-motorcycle classic. He made his racing debut in 1968 in the All-Japan Dirt Trial Championship where he won his first race. In 1983, he established Monster Sports International, a motorsport preparation shop. In 1986 he established Suzuki Sport and returned to the World Rally scene where he competed driving a Suzuki Cultus in the Olympus Rally. 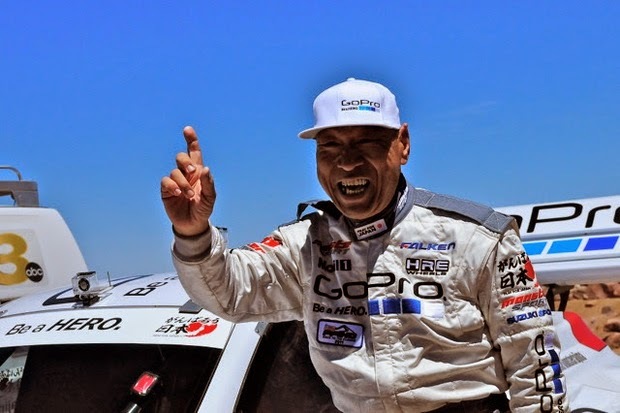 In all, he has taken nine All Japan Dirt Trial Championship titles, four WRC Championship class wins, two class wins in the Asia-Pacific Rally Championships, and his ten Pikes Peak crowns. But, most of all, he's etched his name in motor sports history in The Broadmoor Pikes Peak International Hill Climb, where he will once again climb aboard his latest entry and go for broke and another new record over the 12.42-mile, 156-turn course that ends at 14,110 feet, a familiar hangout for The Monster. Nissan is getting ready to field a plug-in hybrid race car, the ZEOD RC, at the 2014 instance of the 24 Hours of Le Mans. Recently they showed details of the driver controls available on the steering wheel. 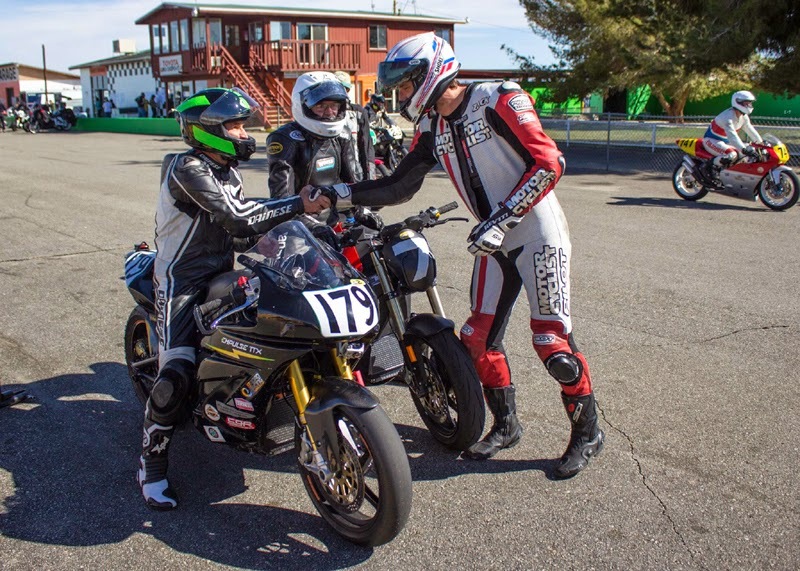 Last weekend the eMotoRacing series event at Willow Springs race track had either four or five entries - the results writeup is a little confusing, because at one point they mention three Brammo's and a Zero, and at another point they list four Brammo's. What they don't mention about Ed Milich is that he's married to Jennifer Bromme, who raced in the 2010 TTXGP with a Mavizen bike. Meaning that there's some history of electric motorcycle racing in his family. Results: Dave Roper won round one on Saturday (best lap time 01:50.546), and Arthur Kowitz won the eight lap race on day two (best lap time 01:45.221). 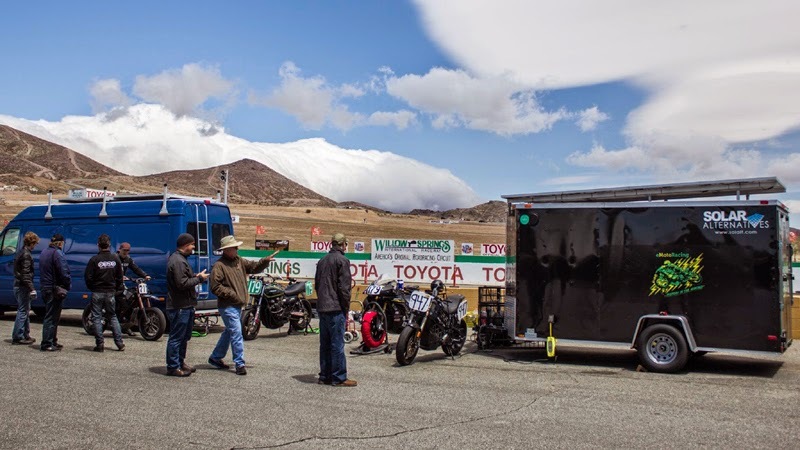 One nice thing is that eMotoRacing is powering their paddock with a portable solar power system mounted on the trailer you see in this picture. Next weekend they're coming to Northern California at Sonoma Raceway. Hurm.. do I go? Yamaha, in their 2013 Annual Report, announced production of the Yamaha PES1 and Yamaha PED1 electric motorcycles would begin in 2016. 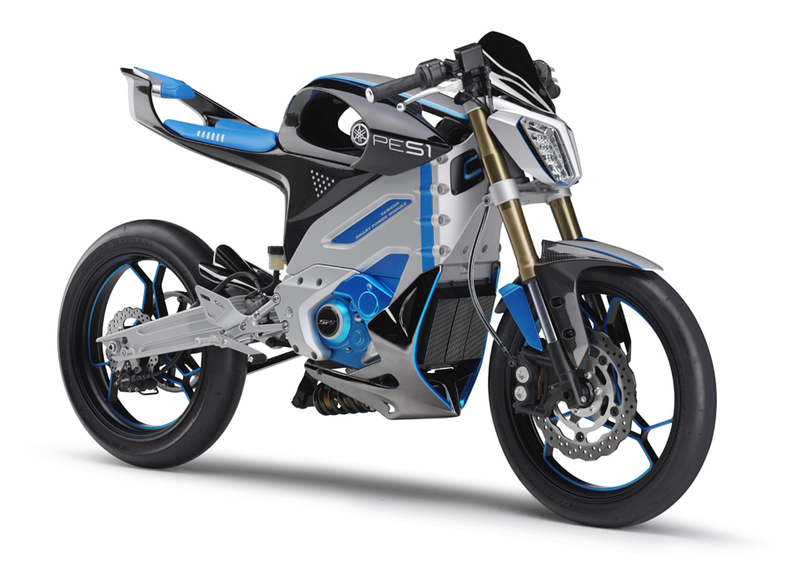 While these aren't electric superbikes, this will make Yamaha the first major motorcycle manufacture to begin building electric bikes. Further, it's a step towards a full-on electric superbike that Yamaha hinted a few years ago would be available in 2020. Back in 2010 when Yamaha announced low scale (1000 units a year) production of a low end (26 miles/hr) electric scooter, the EC-03, the press release said the EC-03 was just the first step of what Yamaha expected would usher in a full line of electric motorcycles by 2020. This line would include a "high output" model. Given Yamaha's role in the motorcycle world, it's fair to assume Yamaha was hinting an electric superbike by 2020. Most of what we know about the PES1 and PED1 comes from the 2013 Tokyo Motor Show, where these bikes were shown, along with and several other electric scooters and bicycles. Let's take a look at everything Yamaha showed last fall to get a sense of where they're going. What I see is the company looking to reuse components on more than one bike. That's a wise move letting them reuse engineering investments to fill out the model line. But is it resulting in lower power? Is the PES1 limited by a drive train meant for dirt bikes? Some of these vehicles are underpowered, uninspiring, or even confusing. The electric bicycle doesn't make sense to me with nearly 20 years of experience riding electric bicycles. It looks like a high end race bike, with aerodynamic wheels and seat/handlebars set up for a serious racer. Why would a serious racer want electric assist? The Yamaha PES1 is a street bike of the same ilk as the Zero S. Except it has less useful functionality. Where Zero puts a "tank" that can either hold cargo or additional battery pack, Yamaha put a swoopy piece of stuff that serves no function other than a resting place for riders in full tuck. And where Zero put in a rear seat, the PES1 will only seat 1 rider. 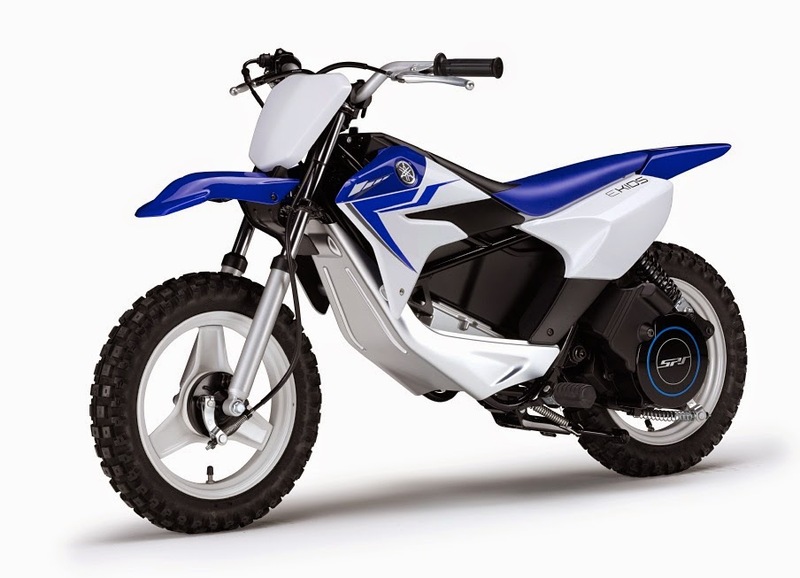 The Yamaha PED1 is a dirt bike. The design is very spare, which makes sense for a vehicle meant to romp around on muddy paths. Both of these bikes have a transmission that's switchable betwen Automatic and Manual. In last fall's announcement, Yamaha said these bikes "retain the same operational feeling that current motorcycle riders are used to". Brammo said a similar thing when at the Brammo Empulse unveiling party in May 2012, that the Empulse has a transmission because it offers familiarity to current motorcycle riders. I don't want to rathole into controversy, it's just interesting to see the same explanation from two companies. The "power unit" (the Yamaha Smart Power Module) is common between the PES1 and PED1. It has a rigid structure that's part of the motorcycle frame, rather than being carried inside the frame. There's nothing about speed or range or charging time. 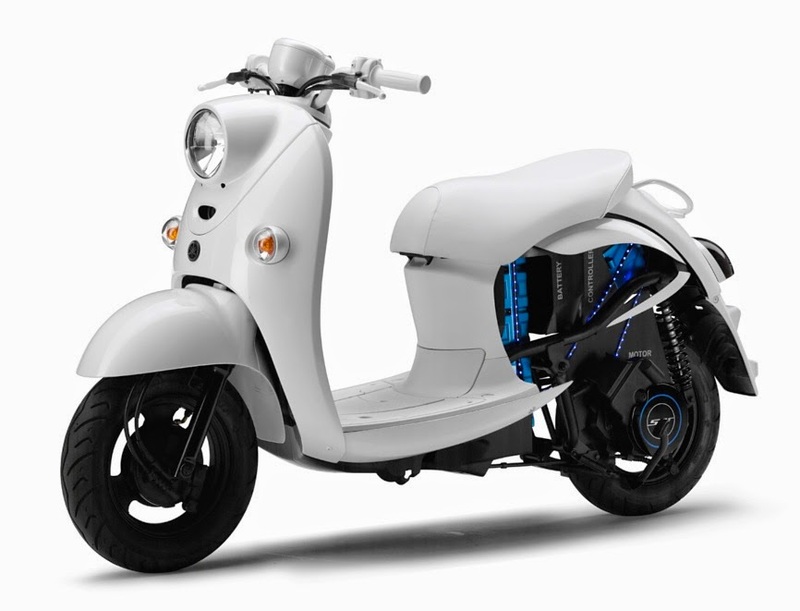 Also shown last fall was the eVino, an electric version of the Yamaha Vino scooter that in turn is inspired by the Vespa. This is meant for urban commuting travel, meaning it has a modest speed and range. There are already plenty of scooters like this on the market, with top speeds in the 30-40 miles/hr range and a 20ish mile range. The eVino supports a removable battery pack. 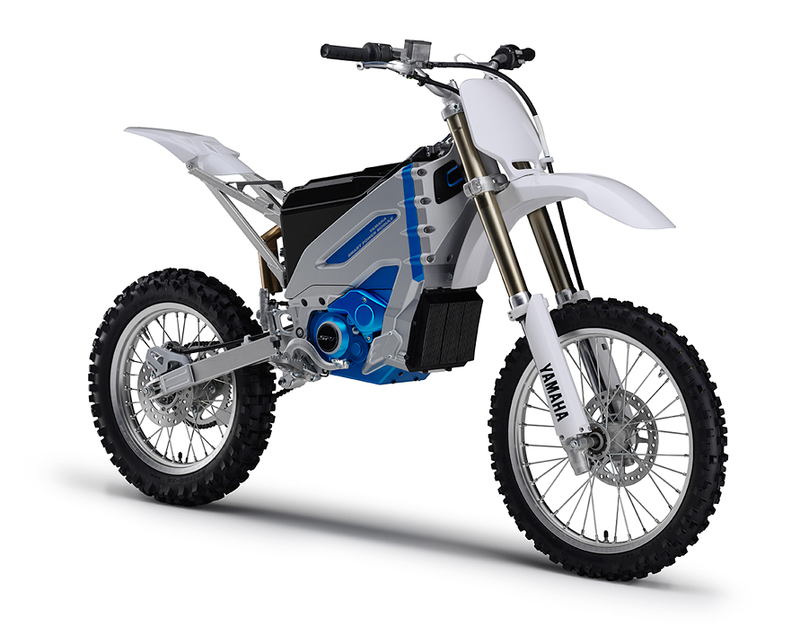 The EKIDS is a dirt bike for youngsters. Several companies make similar products already. In the picture I spy what looks like an electric bicycle battery pack - the sort that is a longish rectangular tube containing batteries, and meant to be easily removable for off-board charging. The drive unit appears to be at the rear wheel. The power unit is the same as on the eVino. The YPJ-01 is an electric bicycle hearkening back to one Yamaha showed 20 years ago. 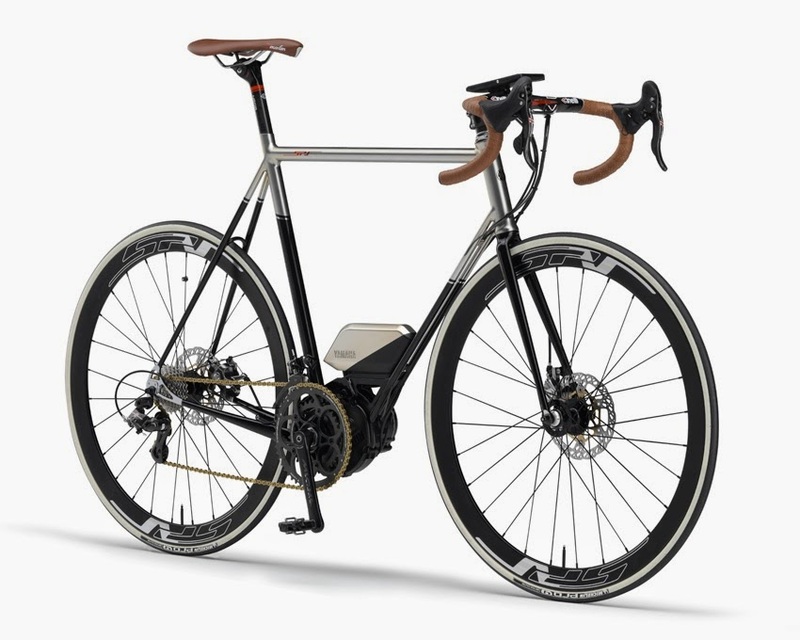 I don't understand the thinking to building what looks like a high end race bicycle, but with an electric motor. To me (I've been riding electric bicycles since 1995) electric bicycles are about utility, not goosing up the speed of a race bike. I would imagine serious race bike people aren't interested in an electric drive for anything other than occasional speed assist, such as hill climbing. The YPJ-01 has a mid-drive system, meaning the motor drives into the rear wheel gearing and therefore the rider gets lots of flexibility in power/effect ratios. Even though it has a 250 watt motor, it will still be pretty speedy because of this. The battery pack looks pretty small, so don't expect much from the range. Maybe Yamaha does mean this to be solely for little speed boosts now and then? 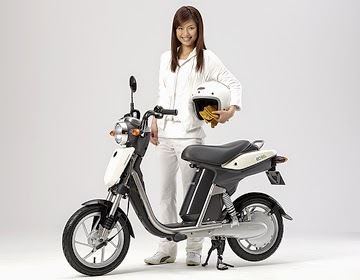 Since I'm going over the known electric bikes from Yamaha, here's the EC-03 from their announcement in 2010. This vehicle has a top speed around 26 miles per hour, and is (or was) in very low production, about 1000/year. There are several similar low end scooters on the market from other makers. 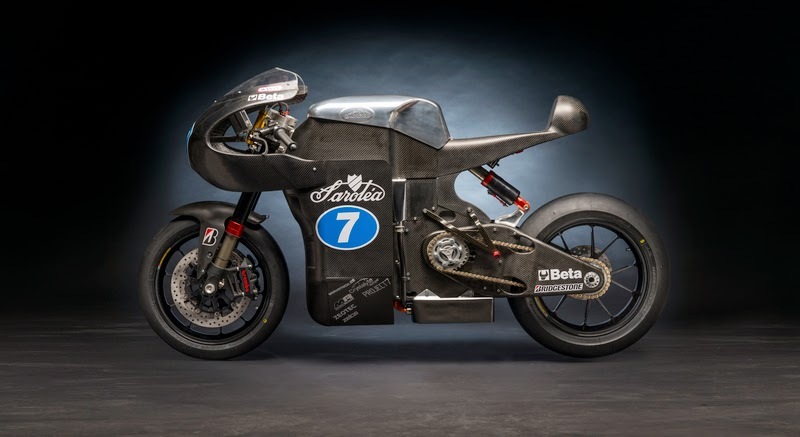 Legendary Belgian motorcycle brand, Saroléa Motorcycles, is returning to racing by entering an electric motorcycle in the 2014 TT ZERO. The bike, the Saroléa SP7 (see below), is a real head-turner, is built with a carbon-fibre frame with an electric motor giving 400 Nm (294.8 lb-ft) and 180 horsepower, for a top speed of around 155 miles/hr and a 0-60 time of 2.8 seconds. Saroléa Motorcycles' history dates back to 1850, and was Belgium's first motorcycle brand. Their entry in the TT ZERO marks not only Saroléa's return to motorcycle racing, but a return to existence. The manufacturer went out of business in 1963. The team is being led by Torsten Robbens. For the TT ZERO, Scotland's Robert Wilson will be riding. The drive train was developed by Thijs De Ridder, a veteran of Europe's electric motorcycle racing scene. He raced in the FIM e-Power series under the Crystalyte Europe name for a couple years. According to a press release from January, De Ridder will be riding for the team in the eRoadRacing series. I find mention of eRoadRacing very curious, because eRoadRacing appears to be dead (their website now throws up an error, and the eGrandPrix site has shown no update since last summer). The Saroléa Racing website says that eRoadRacing dates and locations are yet to be determined. According to the team website, Torsten Robbens comes with 10 years experience in Formula 1 racing, and was the youngest team manager to ever win the 24 Hours of Le Mans. About Thijs De Ridder, he built the first electric motorcycle in Belgium, developed the SP7's drive train, and has 17 years of motorsports experience. The site shows the Crystalyte Europe logo, as well as one for Bravotech. That logo is associated with Bram Vergote, whose expertise is CNC machines and parts fabrication. Today's press release through the TT ZERO quoted Robbens saying: "The Isle of Man TT is the most prestigious motorcycle race in the world. Its 37.73 Mile laps (approximately 60km) also make it the most challenging event for both rider and machine. The TT zero testing programme will focus on optimising the race strategy and aerodynamic efficiency. The combination of the TT Zero challenge and the FIM world cup represents a really ambitious racing programme for us." 0 - 100 km/h: 2,8 sec. It pays to carefully study the sponsor graphics when a team releases specs on their new bike, eh? When you don't you tend to miss big pieces of news - such as Mission Motors supplying drive train parts to Team Mugen. And it turns out that the 2013 Mugen Shinden also had Mission Motors parts. 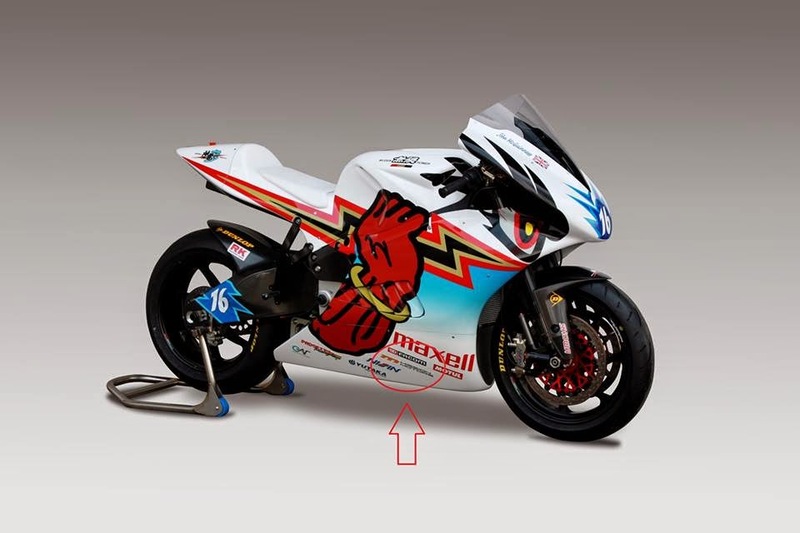 Mugen just released specs of the 2014 SHINDEN SAN, and while I reposted the pictures I didn't study them closely. 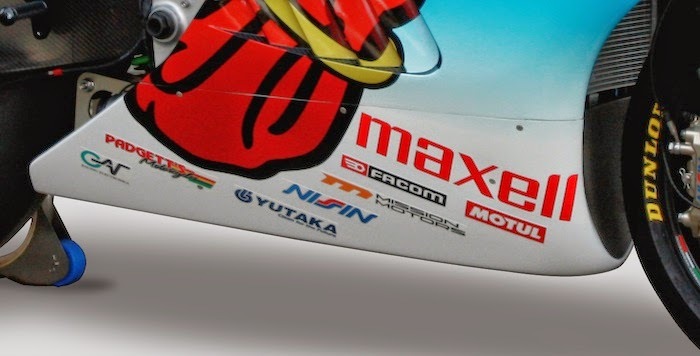 However my colleagues at Moto Elettricheblog did, and posted this picture showing Mission Motors as one of the sponsors. 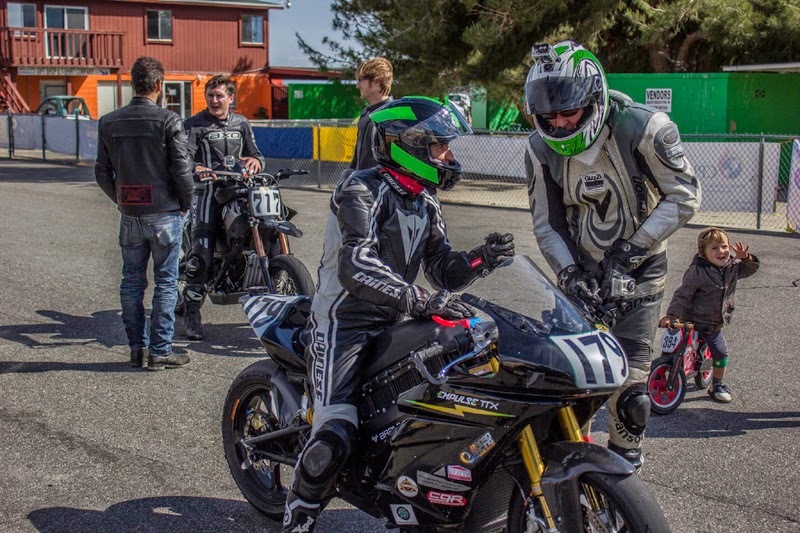 In the facebook conversation that ensued, Kyle Givanen (of the OSU Buckeye Electric Motorcycle Race team) says that at the 2013 TT ZERO he had been invited into the Mugen paddock and saw a Mission Motors MC600 controller sporting Mission Motors logos on the 2013 SHINDEN. Nothing else is a surprise. Maxell is Mugen's cell supplier. Mission Motors and Mission Motorcycles are two separate companies. The latter is working to commercialize the Mission R design that Mission Motors has used as their testing mule. Mission Motors began almost a decade ago with the goal of becoming the Tesla of Electric Motorcycles, but later refocused on developing and selling high performance electric vehicle drive train components. In fitting with the theory that Mugen is acting on Honda's behalf, we do see that Mission Motors and Honda have a history of working together. At the 25 Hours of Thunderhill endurance race in 2010, the Honda CR-Z ran with MissionEVT components, according to a report on Asphalt & Rubber. Mission Motors has long been extremely tight-lipped about their customer list for drive train components. That the company is still in business indicates they do have some customers, but the company is extremely quiet and rarely issues press releases at all. They did, today, issue a press release, Mission Motors' first press release since June 2012, titled - Mission Motors Supplies Team Mugen for 2014 Isle of Man TT Zero Race which reads as follows. 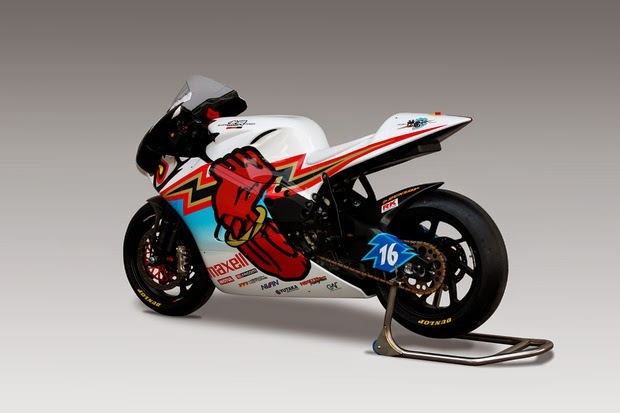 Mission Motors, a developer of cutting-edge electric vehicle technology, has been named a supplier and sponsor of Team MUGEN SHINDEN SAN superbike for the 2014 Isle of Man TT Zero Challenge. With initial integration work now completed, track testing will continue through the spring. Mission is confident that Team MUGEN Shinden has what it takes to capture their first TT Zero victory and a new lap record. MUGEN designs, develops, assembles, and markets automotive engines for racing. Mugen also designs, develops, manufactures, and markets motorsports engines, chassis, parts, and components for Honda cars, including technical services at racing circuits. Learn more at http://www.mugen-power.com/english/. Mission Motors designs, develops and produces optimized electric powertrain components that incorporate the company’s proprietary technology. The company offers energy storage systems, drive systems, control systems, and software intelligence for automotive, powersports, marine and heavy equipment applications. Mission Motors is a full partner to vehicle manufacturers, meeting their development, production supply and aftermarket needs. Mission helps its customers bring higher performance electric and hybrid vehicles to market faster and at lower development cost. Headquartered in San Francisco, California, Mission’s team combines expertise from the automotive, powersports, robotics, battery and software industries. Learn more at http://www.ridemission.com. TT ZERO 110 miles/hr lap speed sure to fall to the 2014 Mugen SHINDEN SAN? Mugen earlier announced they would field two bikes in the 2014 TT ZERO, that they're calling the SHINDEN SAN. Today Mugen has released details, pictures, specs, so let's take a look. It looks like a sure bet to beat the 110 miles/hr lap speed threshold. As last year they've repeated the bright colors and graphics, and centering on the lightning bolt imagery. Shinden is the god of lightning, after all. As we noted earlier Mugen will have two riders, John McGuinness and Bruce Antsey, both of whom have won other races in the TT multiple times. Increased power density and energy density should mean they'll hit and sustain higher speeds. According to the specs (below) the peak power is 100 kilowatts, and it gives 220 nM torque. The 110 miles/hr lap speed is sure to be beaten this year. In 2009 the name of the race was TTXGP, and it was not conducted by the Isle of Man government, but by the TTXGP/eGrandPrix. Brutus Motorcycles is sponsoring Jeremiah Johnson to race their electric motorcycle on Pikes Peak this year. I covered the information a month or so ago. They just posted some pictures of the race bike with the graphics, as well as the race trailer and some other things. From the looks of this, Jeremiah should take a finishing position a fair bit higher than he did last year, riding a Zero S.
This looks like a real serious race bike. Hmm.. I wonder if it has enough power on board for a 38.4 mile race around a certain island? Oh, I'm just digging myself a deep hole aren't I? Guys.. we're all friends here, and I am just saying it would be that much better to take the next step and carry solar panels. Please? A cool looking bike like this deserves to be a great testament to sustainability and clean energy. Post by Brutus Electric Motorcycle.